Desh 17 November 2016 Bangla Patrika ebook pdf. 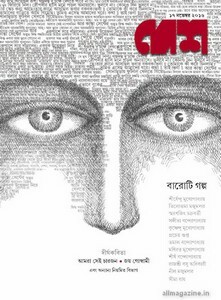 Desh is a traditional fortnightly Bengali literary related magazine of West Bengal which is published by Anandabazar regular new paper from Kolkata. The magazine published on the date of 2nd and 17th in every month. Now I'll share with all literary magazine readers a pdf ebook file of Desh 17 November 2016 edition. This edition's cover stories are Most of the story collection there are twelve stories by various well known authors, poem by Joy Goswami, also have travel news etc. Readers can also collect all old issue of the Bangla Desh patrika.